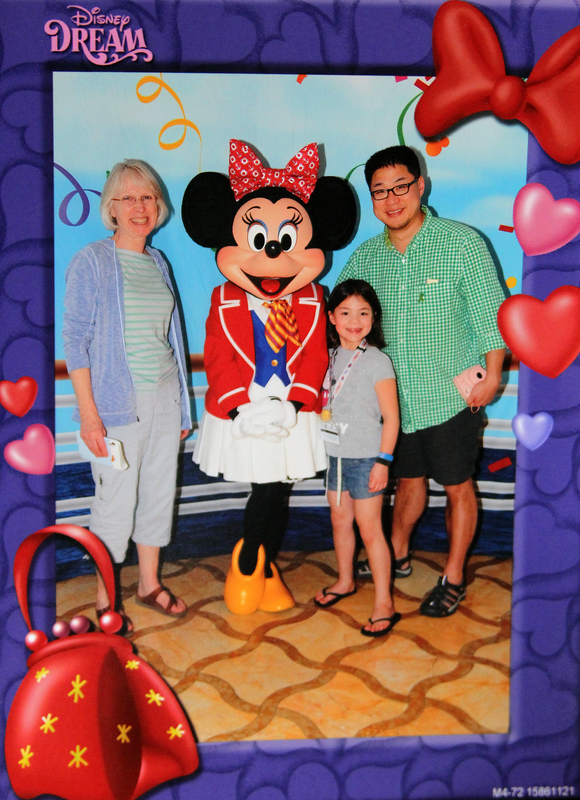 After our stopover in Epcot, we were totally stoked to depart on the cruise. GranMary met us at the hotel and we traveled from Orlando to Port Canaveral together, all set for the adventure to begin. 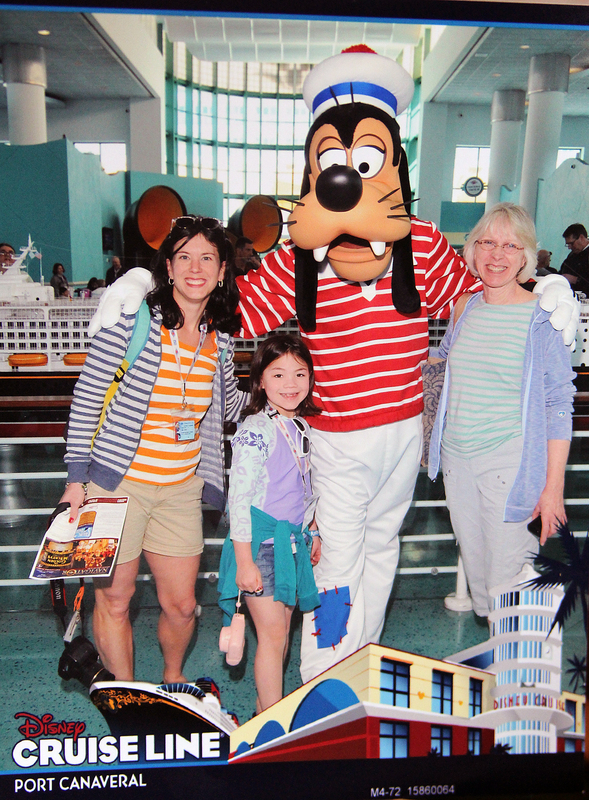 Annie had decided that she wanted to meet (and get autographs from ) as many characters as possible – and so, knowing that we’d have a slight wait at at the terminal, we took full advantage of the opportunity to get a little personal time with Goofy. 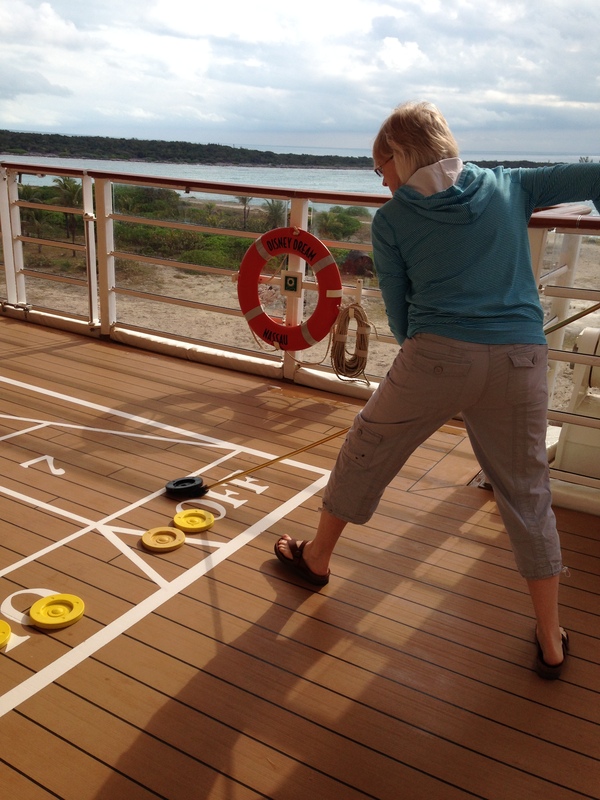 GranMary defined the term “good sport” for the entirety of the trip. 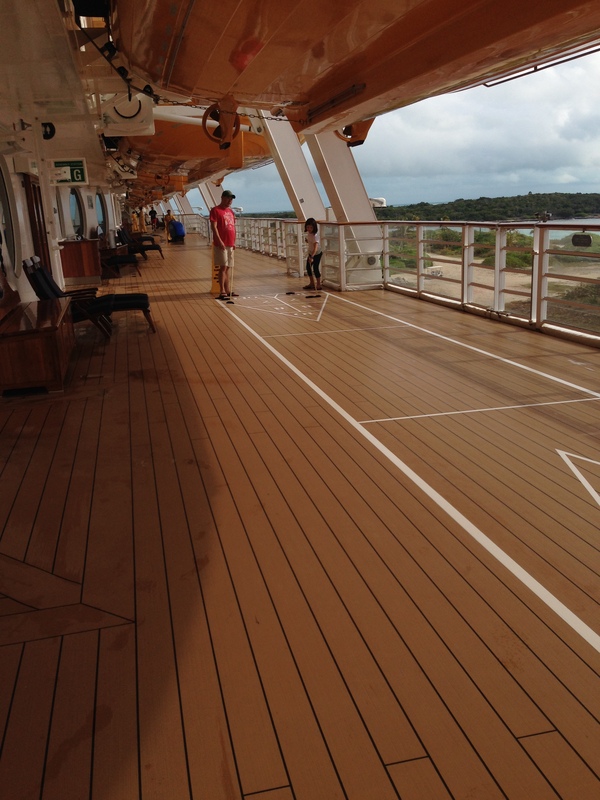 We’d elected to get a room with a balcony (actually, by the time we booked this cruise, all rooms except those with balconies were sold out, so it wasn’t much of an “election” but still…). While it’s hardly an essential, we did enjoy being able to hear the ocean and feel the temperature (something that came in quite handy by the end of our trip). Not quire sure why, but I love this photo. 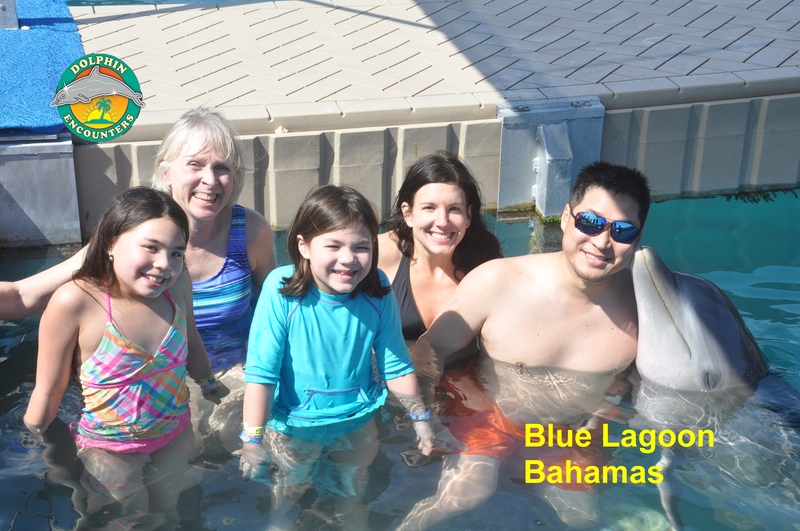 Nick turned 40 on the second day of the cruise and, as part of the celebration, he requested that we do the meet-the dolphin excursion at the Blue Lagoon while in Nassau, Bahamas. It was, hands down, one of the most incredible experiences any of us has ever had (more on that soon…). 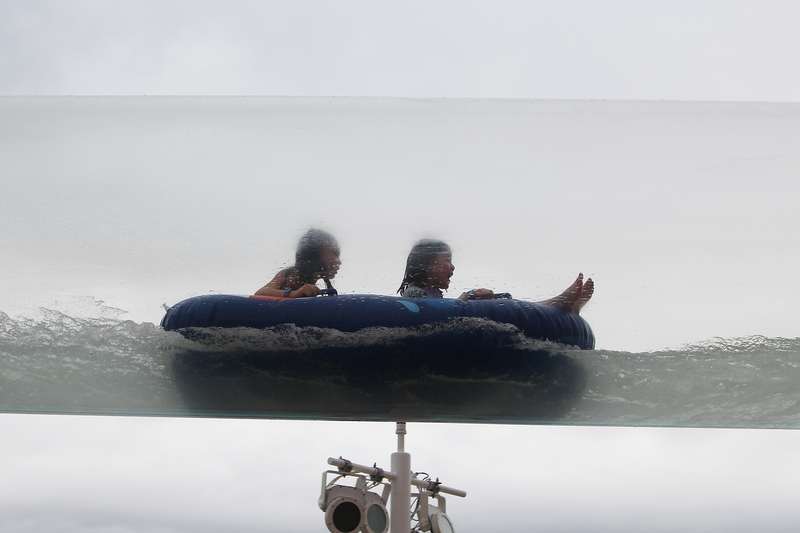 It looks as though we’re shrugging in response to a question, but really, the water was just freakin’ cold. Thumb war battles on the ferry back from Blue Lagoon. Why was GranMary the one who got roped into declaring thumb wars? See: GOOD SPORT. GranMary and I lost, but we put up a good fight, I assure you. Cheering babies on during the fastest crawler race. It was an absolute hoot. 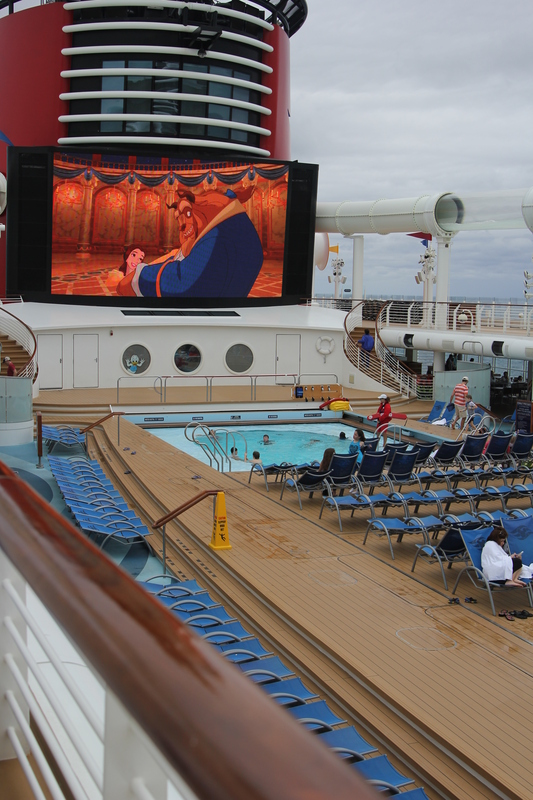 Watching movies while swimming? Yes, please. 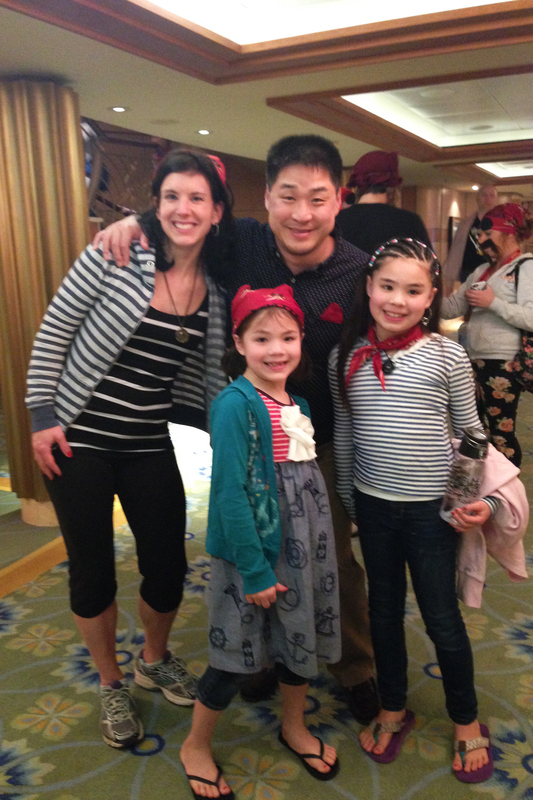 We – um, Annie – met characters. And characters. And more characters. 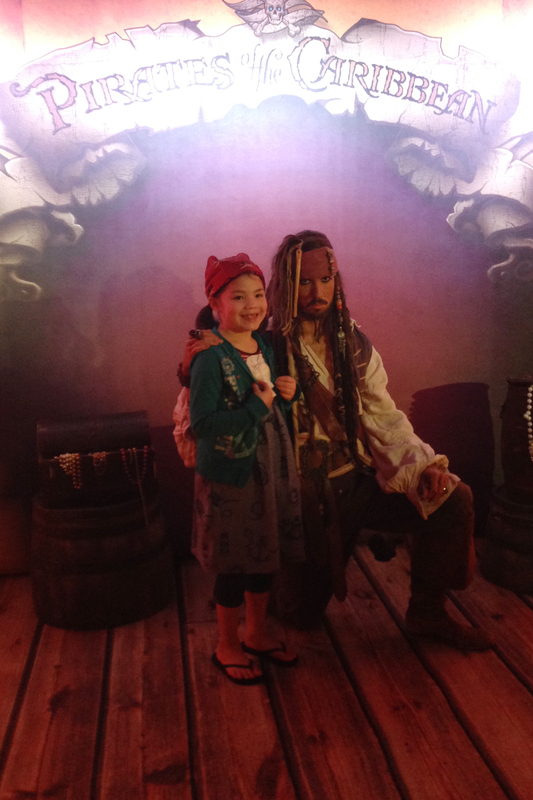 Captain Jack Sparrow took his role very seriously. 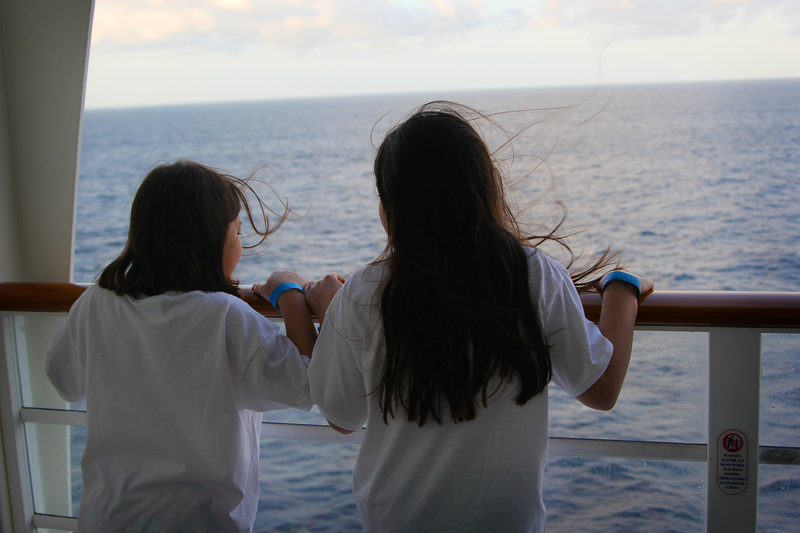 When we returned from last year’s cruise, we said that it was the best vacation ever. And it was. Hence, as excitement mounted for our cruise this year, Nick and I were careful to remind Ella and Annie (and ourselves) that this would be different. Not bad, not at all – but different. It was basically going to be impossible to top, or even match, last year’s experience. Turns out? We were right. And you know that? That’s okay. 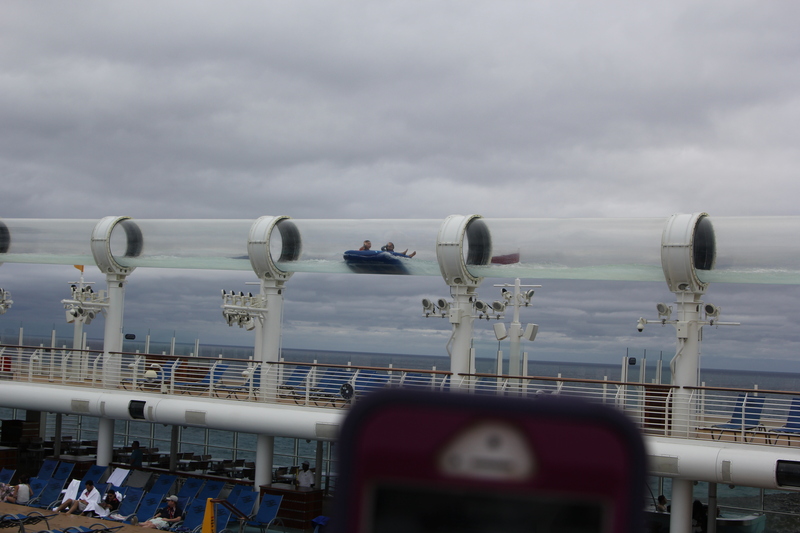 Something that was way better on this ship: the AquaDuck water slide, which encircles the entire upper decks of the ship. Seriously awesome. See, last year, we neeeeeeded that vacation. We’d lost Bill the previous summer and were still emotionally exhausted; I’d started a new job; the girls both took on additional activities which made it hard to find our legs beneath us as our schedules became absolutely nutty; and our winter had started off with ridiculously cold temperatures, meaning that even I – who adore snow and chilly days – was desperate to get warm. This year, it’s different. We still miss Bill very much, of course – and talk about him often, with tears coming at unexpected times – but the pain is not quite so raw, the roller coaster a little more rounded and not quite so exhausting. My job has remained steady and Nick’s has changed for the better. We’ve grown accustomed to swimming and soccer and after-school craziness – which doesn’t make it less crazy, but makes it unsurprising, so we’re steadier on our feet (although our white boards are used just as often, thank you very much). 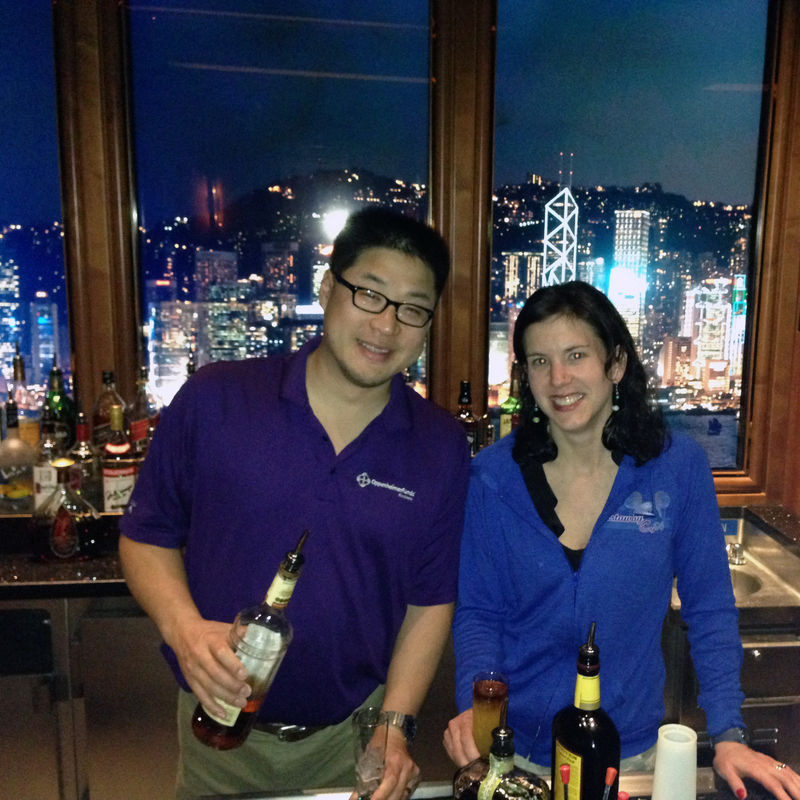 The mixology class did not necessarily make us steadier on our feet, but it was absolutely delicious. And the weather… well. January started off just fine, even nicely. We Rochesterians commented to one another that this was a good winter — not frigid like last year, no huge snowstorms, just a good, even, steady, sunnier-than-usual winter. At least we’re not Boston, hahaha, amIright?? AND THEN CAME FEBRUARY. February, with piles and piles and FREAKING PILES of snow. February, which is already the second-coldest on record (and which, with single-digit temperatures forecasted this week, might become the coldest on record). February, which may be the shortest month of the year but OMG IT SEEMS LIKE IT WILL NEVER END. 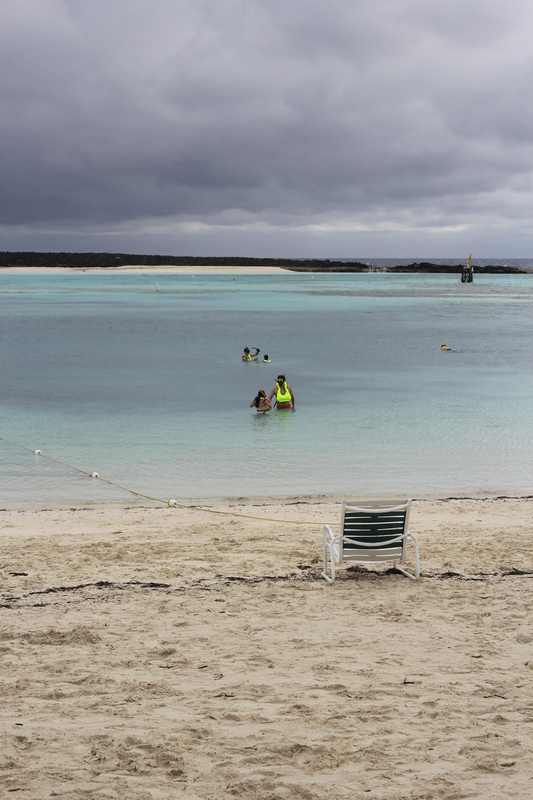 … which basically meant that we had the snorkeling area to ourselves. So, the weather was a definite bummer. 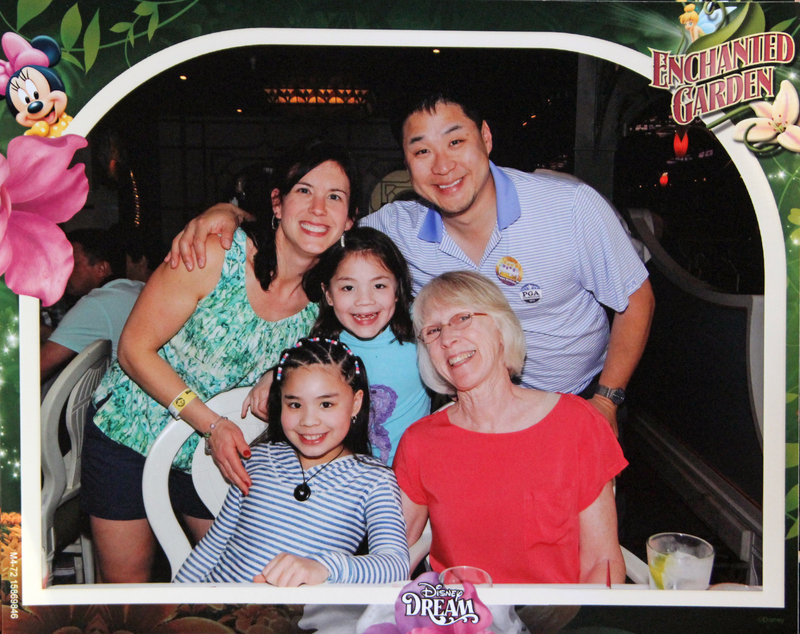 While we were tremendously grateful to be, you know, on vacation – I won’t go whining about it or anything – it was still a bit of a letdown to miss out on the activities we’d planned (plus, being cold in the Bahamas just feels wrong, yo!). 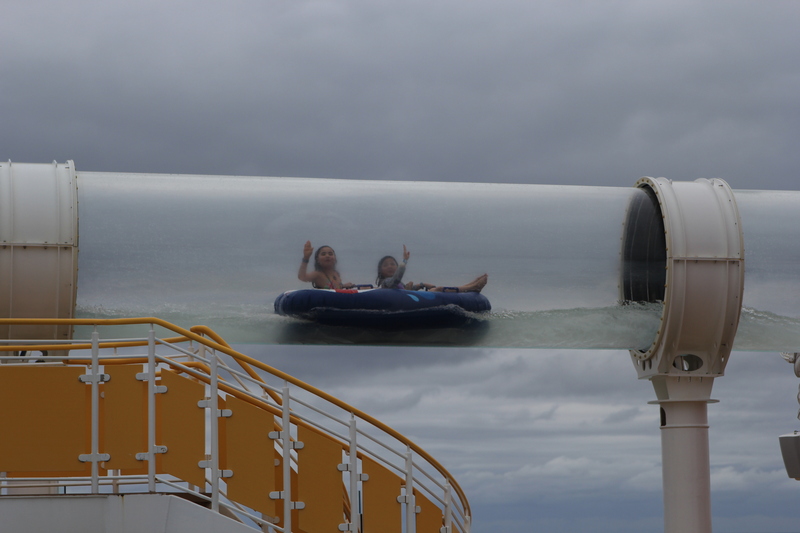 Additionally, high seas and choppy conditions caused most of us, but Ella and me in particular, to become quite seasick – something we hadn’t experienced at all on our previous cruise. And you know those storied kids clubs that I raved about last year and that the girls couldn’t wait to visit again?? The ones where Ella spent nearly all of her time using the computer bays to write elaborate stories and create digital cartoon thingies? 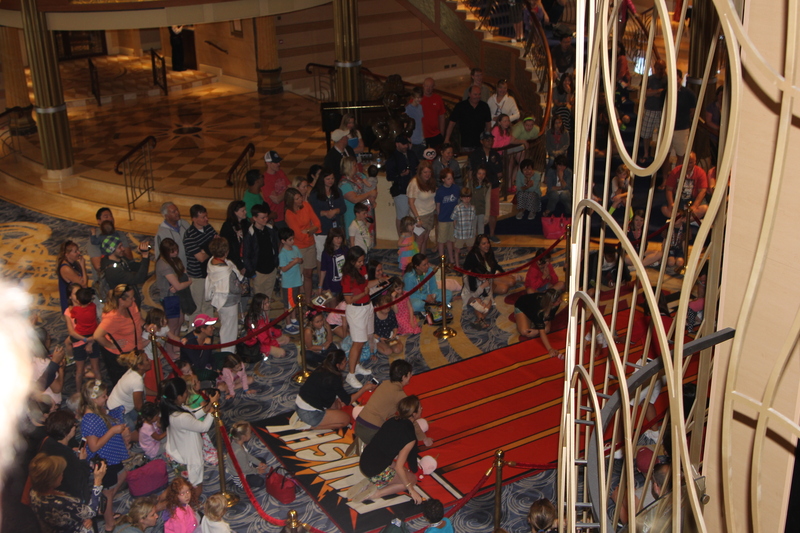 Well, it seems that not all Disney kids clubs are created equal; the ones on this ship didn’t offer the same computer programs (apparently, because our other ship – the Disney Magic – had recently been retrofitted and revamped, they updated their kids club technology). Which meant that Ella didn’t really want to spend time in the clubs. Which… was not awesome. Also not awesome? 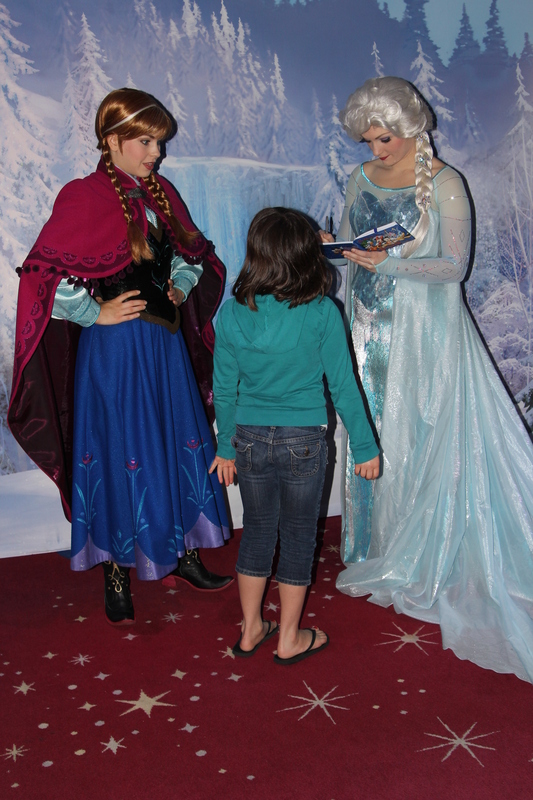 The line to meet Elsa and Anna. I do love how Anna has her hands on her hips, though. Very method. As such – with the weather, the seasickness, and the change in the clubs – this trip had some hiccups, whereas last year’s had none. (We didn’t help ourselves by going to Epcot for a day this year and not Universal; when you’ve walked a mile in Harry Potter‘s shoes, almost nothing else can live up to that hype.) It’s difficult – impossible, really – to compete with perfection. Thankfully, we didn’t need to enter that competition because we didn’t need this vacation in the same way we did a year ago. It could just be exactly what it was – fantastic. If anything, the bumps in the road (the waves on the sea? How far can I stretch this metaphor?) 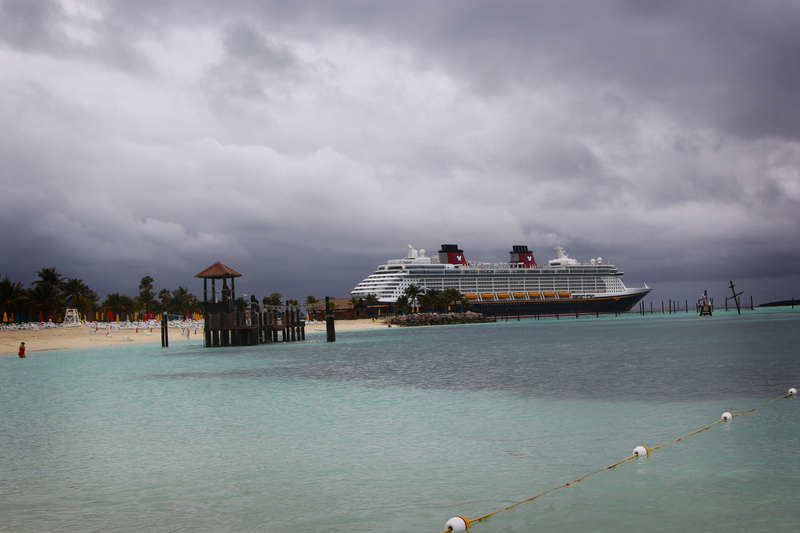 showed us that last year wasn’t just a fluke: we really do love Disney cruises, even when things don’t always go as planned. 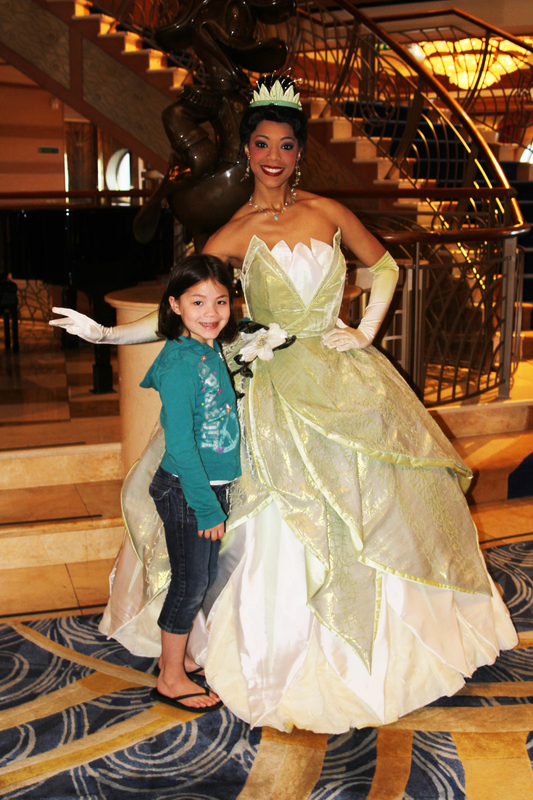 It was particularly neat to be able to share this year’s experience with GranMary – to laugh with her while we watched the girls zoom in and out of the pools, to stifle groans as we waited in line to meet the princesses (GranMary helps the time pass by much more quickly! 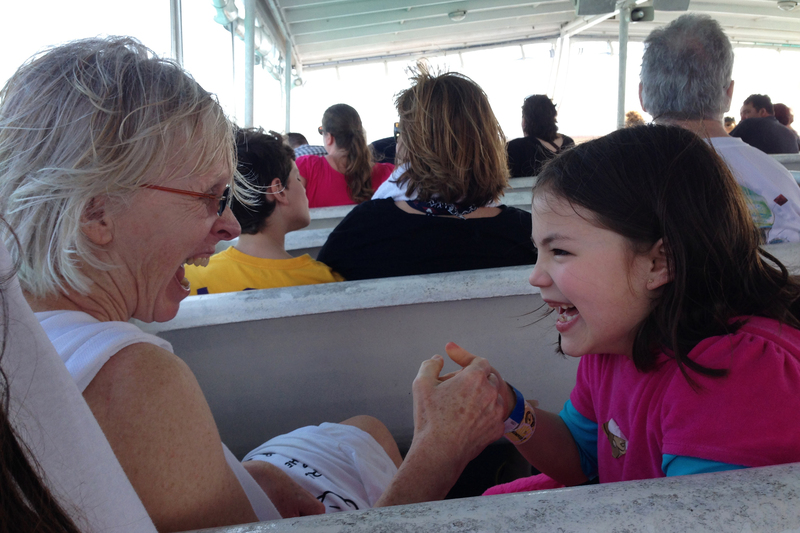 ), to see her come waaaay out of her comfort zone time and time again (let’s just say that dressing as a pirate and kissing a dolphin on the lips are not usually part of GranMary’s routine), to watch as she and Ella and Annie sang and hugged and took in every moment of vacation and joy and fun. 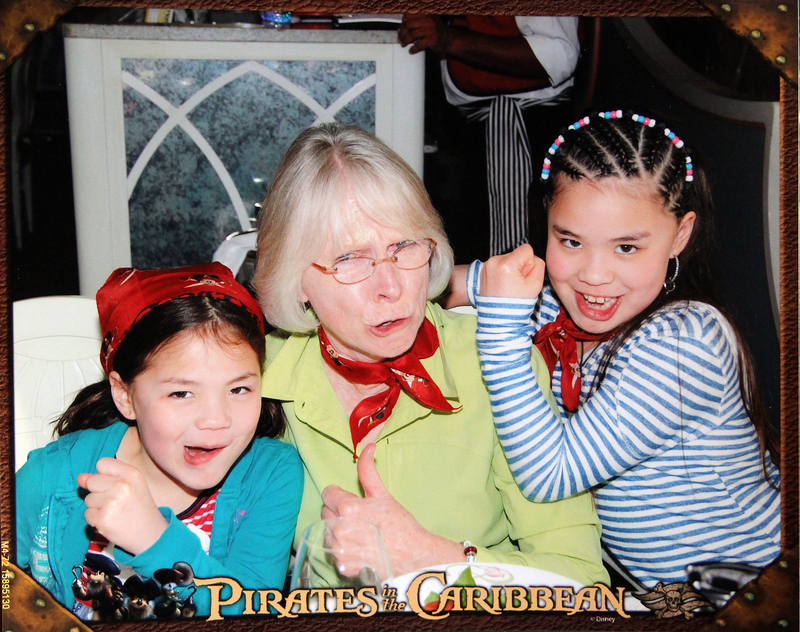 Although she is very convincing here, I can assure you that Mary does not typically “arrr!” like a pirate. As I sit here listening to the dripping of the icicles inside our front door (no, for real, inside the door; when all of this begins its meltdown [because, for the love of all things holy, IT MUST MELT AT SOME POINT, right??] it’s not going to be pretty), squinting as the sunlight reflects off the feet of snow in the backyard (but at least it’s sunny!! ), the memories of our trip seem that much sweeter. Even without this doozy of a winter, however, the trip would stand on its own. How fantastically lucky we were to have taken it! 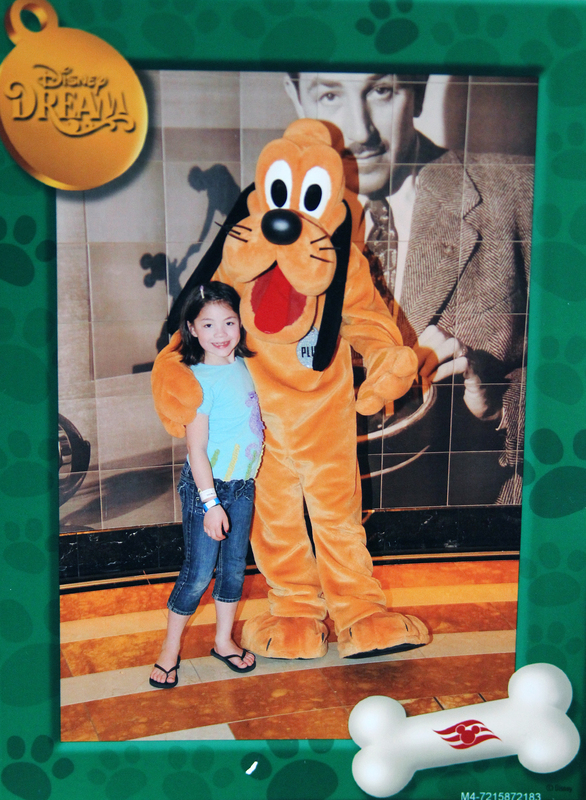 This entry was posted in good life, typical crazy and tagged Annie, cruise, DCL, Disney, Disney cruise, Disney Dream, Ella, family, GranMary, parenthood, travels, vacation by missemtoo. Bookmark the permalink.